Since being named a cardinal and being reassigned as archbishop of the Archdiocese of Newark, N.J.—where he was installed as shepherd on Jan. 6—Cardinal Joseph W. Tobin has been sought by dozens of major media outlets for an interview, including the National Catholic Register, The New York Times, BBC World News and other agencies in Italy, Spain, Ireland and Belgium. But when an e-mail of questions came from a reporter for the St. Thomas Aquinas School’s Tiger Prints newspaper in Indianapolis, Cardinal Tobin made sure to clear his schedule for an in-person interview. Miles Barth, a seventh-grade student at the school, arrived at the Archbishop Edward T. O’Meara Catholic Center in Indianapolis with pen and notebook ready to go on Dec. 1. 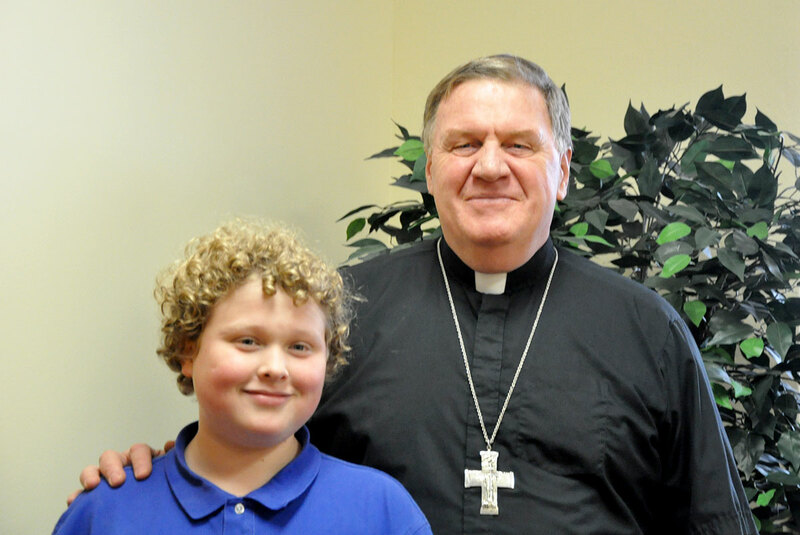 Accompanied by his father John Barth, his English teacher Amy Board and his principal Cara Swinefurth, Miles was led into the chancery and introduced to Cardinal Tobin. “I wasn’t that nervous because when I met him, he was really nice, very warm,” said the young reporter. The group settled into a conference room, and the questions began. For about 15 minutes, Miles asked Cardinal Tobin questions about how he learned he was named a cardinal, his and his family’s reaction to the news, how he felt about moving to Newark, and what goals he hoped to accomplish there. There were also questions that elicited pauses and deep thought from the cardinal, such as his favorite memory from his time in the archdiocese. “I’ve never baptized that many people in my life! Just to see that new life and to know that there were lots of people … who just welcomed these people into the Church—they made the Church attractive for them. Another question Miles asked that provoked some thought was what Cardinal Tobin felt his greatest accomplishment in the archdiocese was. After pause for reflection, the cardinal responded. “There are 131 parishes in the archdiocese scattered across 39 counties, and I always said the challenge here is to move the archdiocese from being an archipelago—that’s one of my favorite words, which is a bunch of islands—to being a network, so that these 131 parishes feel like they’re part of something bigger, and not only feel it but show it by working together,” he said. At the end of the interview, Miles asked Cardinal Tobin what advice he would give to the students of St. Thomas Aquinas School. There was no pause from the cardinal on this answer. “Be the best you can be,” he said. “The way I understand that is developing all the gifts God has given you, especially including the gift of faith. “I think the longer I live, the more I realize intelligence and all that stuff, that’s great stuff. Athletic ability—that’s good. If you dance or write or be a journalist like you, that’s all great. “But what pulls it all together is faith, because that reminds me that everything I have is a gift. It’s not my sole accomplishment. Miles has been developing both his faith and his interest in writing at St. Thomas Aquinas School since kindergarten. This is his second year writing for the school paper. “You get to start writing for it in sixth grade,” he explained. “Everyone has to write an article every quarter, and certain articles get in—editors choose them. Now he faces the task of writing an article based on his interview with one of only 11 cardinals in the United States.